Storytelling – The official website of author and storyteller David Neilsen! Time For Some Halloween Fun! Halloween season is upon us, and I could not be more giddy. I have a slew of events and projects over the next six weeks that will be fun and crazy and creepy and awesome. It all starts this weekend with the 4th Annual Warner Library Headless Halloween Mini-Golf event. All day, on Saturday, September 23, the hallowed halls of our venerable library are turned into 19 holes of mini-golf awesomeness! I’ve overseen this glorious event since its inception and am blown away with what the other builders come up with. That skull opens and closes its mouth! Friday, September 29, I begin my unofficial residency at Sleepy Hollow Cemetery by hosting an original murder mystery event: Murder at Sleepy Hollow Cemetery. Someone is going to die and everyone is a suspect! Even you! Be warned, tickets are very limited! The next day, Saturday, September 30, I’ll be back at the cemetery presenting Dark Dahl – Roald Dahl’s Creepy Tales at 5:00 and then again at 7:30. On Thursday, October 5, I’ll be doing a reading of my latest Middle Grade novel, Beyond the Doors at the Warner Library in Tarrytown at 7:00. Saturday, October 7, will find me spending the day at the Collingswood Book Festival in Collingswood, New Jersey. Then on Monday, October 9, I’ll be back at Sleepy Hollow Cemetery for two performances of An Evening With Edgar Allan Poe. Shows are at 5:00 and 7:30. I will be appearing at the Barnes & Nobles in Yonkers, NY on Friday, October 13 (Friday the 13th!) for a reading and signing at 6:30. The next day, Saturday, October 14, is the annual Sleepy Hollow Street Fair in Sleepy Hollow, NY. I’ll have a booth with books and goodies so come on by! And that takes us through the first half of October! There’s plenty more in the second half, including an exciting new project I’ve been working all year on with Historic Hudson Valley that I hope to be able to announce soon. Author neilsendavidPosted on September 20, 2017 September 20, 2017 Categories Book Event, halloween, One Man ShowsTags beyond the doors, edgar allan poe, halloween, reading, roald dahl, sleepy hollow cemetery, Storytelling, washington irvingLeave a comment on Time For Some Halloween Fun! Ladies and Gentlemen, I am pleased to announce that I’ve opened the doors on my school visits programs and am officially available for bookings. Putting together the programs has been a lot of fun, and I’m excited to bring them to schools across the known world and present them to real live children, as opposed to the various stuffed animals I’ve been practicing my presentations on. Cthulhu was especially engrossed by my presentations. You can get all the details over on my School Visits page, but the upshot is that I’ve crafted programs for both large, auditorium audiences as well as smaller, classroom-sized engagements. Each program is designed around my own areas of expertise and experience, and each has been proven to be highly educational and entertaining–at least none of the stuffed animals have complained so far. I really am excited to get out to schools and meet with students. I’ve already done a lot of visits to schools as a storyteller, particularly with my American Revolution program, but this will be the first time I’ll be visiting as an author. Before I was just an oddly-dressed guy showing up at their school, but now the students may have read my book and know my work. That’s very exciting. Tomorrow night, I will go insane. 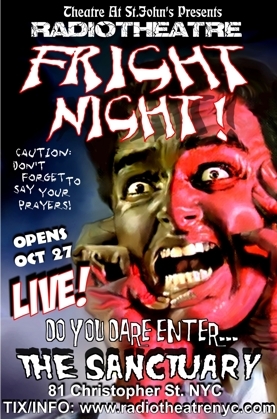 Tomorrow night–Tuesday, November 10 at 8:00 pm to be precise–I will preform in RadioTheatre’s production of Fright Night, a series of three marvelously-creepy stories told radio theater style in front of a live audience. The show is at The Sanctuary at St. John’s, located at 81 Christopher Street in Manhattan. And that’s the end of the shameless promo. Follow one of the links (they’re all the same) for tickets and information. The show consists of three stories, and I’m in two of them. In case you’re interested, I witness someone else go mad in the first piece, then go mad in the second. Because I’m nothing if not a follower. But what is, perhaps, the coolest thing for me is that I’m also providing the voice of the host of the show, welcoming the audience to the evening and introducing each of the three stories. For the story intros, I use my deep ‘I’m so ridiculously evil’ voice. But for the intro to the entire evening, they throw some sweet-sounding effects on my voice as I speak and I pretty much sound like your worst nightmare come forth from the depths of the abyss to devour your soul. Once it was explained that no, this was actually my voice, except it wasn’t, I was more comfortable. But the whole bit where I would speak and then hear myself half-a-second later kinda through me. The opening intro is matched with a lovely, 20-second or so bit of Maddening Music. The first time through with the Evil Echo it was so distracting to me that I was only half-way done when I ran out of Maddening Music. The only way for me to speed up is to somehow shut my own tremendously evil-sounding echo out of my mind, which is harder than it sounds. And actually, it doesn’t sound all that easy. When it all comes together, complete with spooky lights, nasty, creepy sound effects and music, and everyone going full-performing mode, it’s super sweet. Earlier today, I got all dolled up in period dress and preformed The Legend of Sleepy Hollow for an appreciative crowd at Warner Library. The event was the Gunpowder Kids awards, where kids who have volunteered in the village throughout the year are celebrated. A good group, of all ages, and they ate it up. My performance is a fully-memorized one-man show. It spans around 25 minutes, tells the whole story using Irving’s words, and generally leaves the audience satisfied. Right in the middle of the story, however, my mind went absolutely, 100% blank. I just plum lost everything. One second I was running full steam ahead, the next my head was as empty as leaky bucket. Which I would think would be very empty. Hence the metaphor. So I broke into that special, split-personality thing performers do when their body is going through the motions while the mind is scrambling for something. I sort of half-repeated what I’d just said, slowing down both for effect and a desire to stretch out the time, while my mind backed-up and quickly ran through it again, trying to figure out what I’d missed. It didn’t work. I gave up backing up and scanned ahead, looking for a good place to jump back into the story. Meanwhile, my lips started babbling random words that felt like they belonged, trying desperately not to lose the audience. After what seemed forever, but was probably only a few seconds, I dove back in with both feet and got back into the rhythm of the story. Yes, I had skipped some things–and of course once I started, I realized where I’d gone wrong and had to resist the urge to go back–but I managed to pull the train into the station, so to speak. When I was done, everyone erupted with applause. They loved it. And not a one had any idea that I’d utterly blanked in the middle of the show. I even asked a couple of my friends if they’d noticed anything, but they didn’t. They thought I had been perfect. This has happened before. Point of fact, I doubt I have ever done one of my one-man shows the same way twice. I used to wonder why the audience seemed oblivious to my obvious missteps. But I long ago realized the key to getting through these momentary mind-erasures–bluff. As long as I seem confident, nobody knows the difference. Bluff and bluster and just keep saying something. Anything. What the audience doesn’t know can’t hurt you.